Recently we came across this sweet record from our very lovely Midwest. It was difficult not to notice the old “Chicago sound” – this tasteful mix of folk, rock and blues. Listening to John Michaels & Seven Ships‘ “Other Side of The Stars” was a very pleasant 55 minute journey, masterfully guided by the Chicago musician and songwriter John Michaels and fellow singer Barbara Hollek. All songs get along very nicely, the whole album feels very well-rounded. For most songs what at first glance may seem like simple and easy on the ear tune turns out to be a rather complex symphony of many beautifully written parts. The Lazy Cocoon: Hi John, first off John, great work on the album. It sounds great! Where did you record it? John Michaels: The name of the studio was “Gallery Of Carpet Recording” located in Villa Park and now newly re-located in Georgia. There are some pictures of it on the band Facebook page. TLC: All 12 songs are very personal. And then there is Dance of the Dawn. What is the story of that instrumental? How did it make it on the album? JM: On the first record there was a very short quirky instrumental that opened the record and then it repeated again somewhere in the middle. I had the idea of putting a short instrumental on each record I do and making it a signature tradition for something different. It started out as just a guitar piece, but obviously grew into something much bigger. In retrospect, I probably would have left it as a guitar piece. It’s the one thing that I’m a little disappointed with. I used real instruments for everything except for that one because it would have taken a 30 or 40 piece orchestra to do it and that wasn’t realistic. I tried to do it all on the keyboard but it never quite lived up to my vision for it. TLC: We always take at least one song and post it for free download so our readers can take a piece of your work with them in their life. Is there a particular song you would like to share with them? JM: I asked myself the question when trying to decide which song to put first on the record; if there were only one song on this album that people could ever hear which one would I want it to be? I picked “Other Side of the Stars”. It’s personally the most important song to me because it was inspired by a letter my father wrote to me of the same title and I feel that lyrically it speaks best for where I’m at, what I think, feel, and musically for how I’ve grown. TLC: What was the hardest thing for you throughout the whole process? JM: Approaching everything patiently. I was anxious to get it done, but there were a lot of obstacles to face that slowed it down and I was forced to be patient. Next to that was recording the vocals. I don’t consider myself a gifted singer so I felt a lot of pressure about getting good vocal takes. That was hard. TLC: Is there anyone in particular you would like to thank and why? JM: That would have to be my dad, without his financial help and support there wouldn’t be a record. I may have produced it with Brian Zieske, but my dad made it possible. He was the bank behind it and because of his willingness to invest in me we were all given and opportunity. 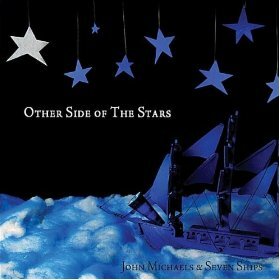 John Michaels & Seven Ships will be soon announcing the official release date for the newly completed album, “Other Side of The Stars.” Let’s wish them luck and hopefully we will be seeing them touring in the second half of 2012.